STAMFORD — The magical journey of the Westhill High School girls volleyball team marched on Tuesday night as the No. 1 seeded Vikings rolled to a 25-14, 25-14, 25-20 home triumph over No. 8 seed Staples High in the FCIAC playoff quarterfinals at the J. Walter Kennedy Athletic complex. The victory means Westhill (19-2 overall) will battle No. 5 seed Darien in the 5 p.m. semifinal on Thursday at the Ludlowe High gymnasium. Darien ousted Greenwich, 3-0 on the road Tuesday night. No. 6 Ludlowe and No. 2 seed Trumbull will meet in the 7 p.m. semifinal Thursday. The best parts of this Westhill volleyball squad, currently seeded No. 3 in Class LL, is its depth, its versatility and its solid fundamentals. The Vikings used their crisp serving as a springboard in Game 1 and Game 2. In Game 1, Westhill jumped out to an 11-4 edge as Sophia Thagouras racked up six straight aces. In Game 2, ‘The Weapon’— junior Caroline Boyd — picked up six of her nine aces on the evening as Westhill rolled to an 11-1 lead. 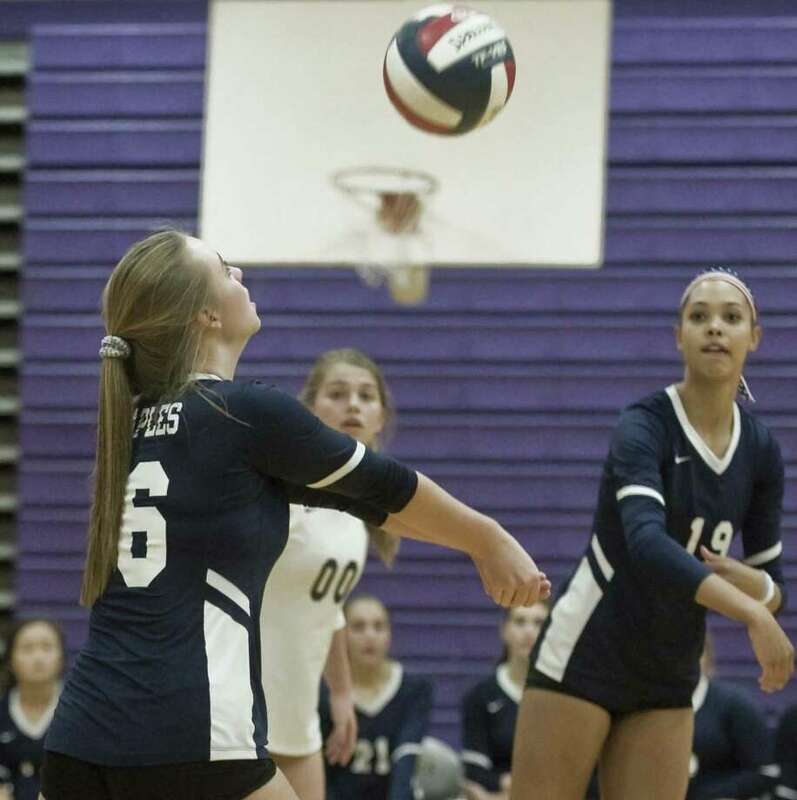 Staples (12-9 overall) was battling uphill all night in part to junior hitter Jane Van Arsdale going out with a left foot injury early in Game 1. Without Van Arsdale, the Wreckers’ player rotation changed dramatically. Also Staples became a very short team when senior hitter Bella Jagenberg went to the bench during the back row portion of each of her rotations. The FCIAC West Division regular season crown and a No. 1 playoff seed are fine accomplishments. But the postseason is where this Westhill squad can put new banners on the gymnasium wall. The Vikings have not won an FCIAC championship since 1986. They were FCIAC runnerups in 2004. Westhill knows it is two long, tough steps away from a league title. Westhill has won nine of its last 10 but is taking nothing for granted. That lone defeat was at Ludlowe’s gym back on Oct 17. Records: Staples 12-9 overall; Westhill 19-2 overall. Highlights: S—Bella Jagenberg 10 kills, 3 blocks. W—Caroline Boyd 14 service points, 9 aces. Vana Servos 15 assists, 9 service points, 6 digs. Betsy Sachs 12 kills, 8 service points. Sophia Thagouras 11 assists, 7 service points, 6 aces, 4 kills. Nina Bakuradze 7 digs, 2 aces. Nikki Newcomer 9 kills, 8 digs.